This slimy nautilus turned out to be even more elusive than its siblings. Aside from another brief sighting by Saunders in 1986, Allonautilusdisappeared until July 2015, when Ward returned to Papua New Guinea to survey nautilus populations. Since nautiluses are expert scavengers, Ward and his colleagues set up “bait on a stick” systems each evening — fish and chicken meat suspended on a pole between 500 and 1,300 feet below the surface — and filmed activity around the bait for 12 hours. The nautilus (from the Latin form of the original Greek ναυτίλος, 'sailor') is a pelagic marine mollusc of the cephalopod family Nautilidae, the sole extant family of the superfamily Nautilaceae and of its smaller but near equal suborder, Nautilina. It comprises six living species in two genera, the type of which is the genus Nautilus. Though it more specifically refers to species Nautilus pompilius, the name chambered nautilus is also used for any species of the Nautilidae. A cephalopod is any member of the molluscan class Cephalopoda (Greek plural κεφαλόποδα, kephalópoda; "head-feet"). These exclusively marine animals are characterized by bilateral body symmetry, a prominent head, and a set of arms or tentacles (muscular hydrostats) modified from the primitive molluscan foot. Fishermen sometimes call them inkfish, referring to their common ability to squirt ink. The study of cephalopods is a branch of malacology known as teuthology. Nautilidae, both extant and extinct, are characterized by involute or slightly evolute shells that are generally smooth, with compressed or depressed whorl sections, straight to sinuous sutures, and a tubular, generally central siphuncle. Having survived relatively unchanged for millions of years, nautiluses represent the only living members of the subclass nautiloidea, and are often considered "living fossils." The name "nautilus" originally referred to the pelagic octopuses of the genus Argonauta, otherwise known as paper nautiluses, as the ancients believed these animals used their two expanded arms as sails. Nautiluses are the sole living cephalopods whose bony body structure is externalized as a shell. The animal can withdraw completely into its shell and close the opening with a leathery hood formed from two specially folded tentacles. The shell is coiled, aragonitic, nacreous and pressure resistant, imploding at a depth of about 800 metres (2,600 ft). The nautilus shell is composed of two layers: a matte white outer layer, and a striking white iridescent inner layer. The innermost portion of the shell is a pearlescent blue-gray. The osmeña pearl, contrarily to its name, is not a pearl, but a jewellery product derived from this part of the shell. Internally, the shell divides into camerae (chambers), the chambered section being called the phragmocone. The divisions are defined by septa, each of which is pierced in the middle by a duct, the siphuncle. As the nautilus matures it creates new, larger camerae, and moves its growing body into the larger space, sealing the vacated chamber with a new septum. The camerae increase in number from around four at the moment of hatching to thirty or more in adults. To swim, the nautilus draws water into and out of the living chamber with its hyponome, which uses jet propulsion. While water is inside the chamber, the siphuncle extracts salt from it and diffuses it into the blood. The animal adjusts its buoyancy only in long term density changes by osmosis, either removing liquid from its chambers or allowing water from the blood in the siphuncle to slowly refill the chambers. This is done in response to sudden changes in buoyancy that can occur with predatory attacks of fish, which can break off parts of the shell. This limits nautiluses in that they cannot operate under the extreme hydrostatic pressures found at depths greater than approximately 800 metres (2,600 ft), and in fact implode at about that depth, causing instant death. 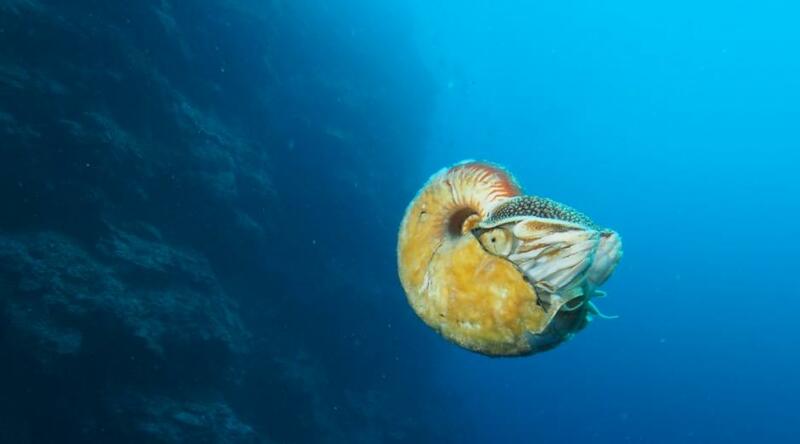 Nautiluses are much closer to the first cephalopods that appeared about 500 million years ago than the early modern cephalopods that appeared maybe 100 million years later (ammonoids and coleoids). They have a seemingly simple brain, not the large complex brains of octopus, cuttlefish and squid, and had long been assumed to lack intelligence. But the cephalopod nervous system is quite different from that of other animals, and recent experiments have shown not only memory, but a changing response to the same event over time. The lifespan of nautiluses may exceed 20 years, which is exceptionally lengthy for a cephalopod. However, nautiluses typically reach sexual maturity when they are about 15 years old. Nautilus pompilius is the largest species in the genus. One form from northwestern Australia, once called Nautilus repertus, may reach 26.8 centimetres (10.6 in) in diameter. However, most nautilus species never exceed 20 centimetres (7.9 in). Nautilus macromphalus is one of the smallest species, usually measuring only 16 centimetres (6.3 in). 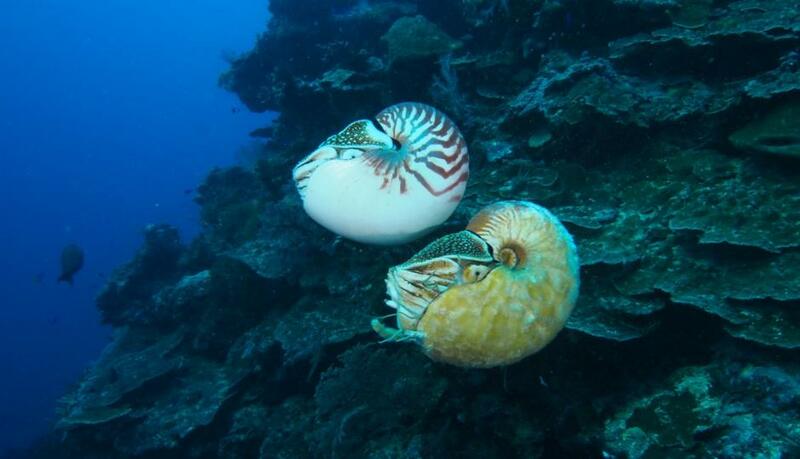 A dwarf population from the Sulu Sea (Nautilus pompilius suluensis) is even smaller, with a mean shell diameter of 115.6 mm. 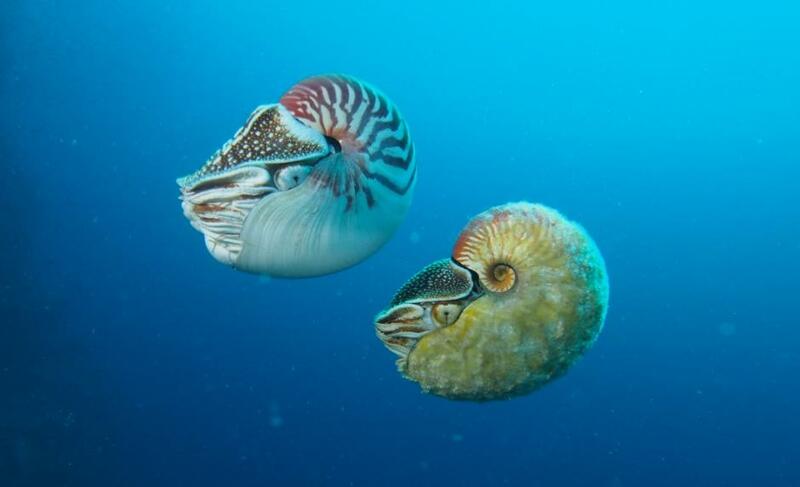 Their limited ecological range and the late onset of their sexual maturity combined with this overfishing has led to recent investigations into the need to protect them from possible endangerment or extinction though no regulations yet exist and thus the nautilus remains unprotected. The Burghley Nef is a silver-gilt salt cellar made in Paris in 1527–28 (or possibly earlier). In medieval France the word 'nef' was applied to various types of boat-shaped containers, including the most magnificent objects intended for the dining tables and buffets of the rich. Apart from having an obvious ornamental quality, their function was to hold personal pieces of cutlery or, as in this case, salt or spices—there is a detachable compartment on the rear deck, which was presumably passed around the table. This nautilus shell, mounted in silver, was a rare natural curiosity.